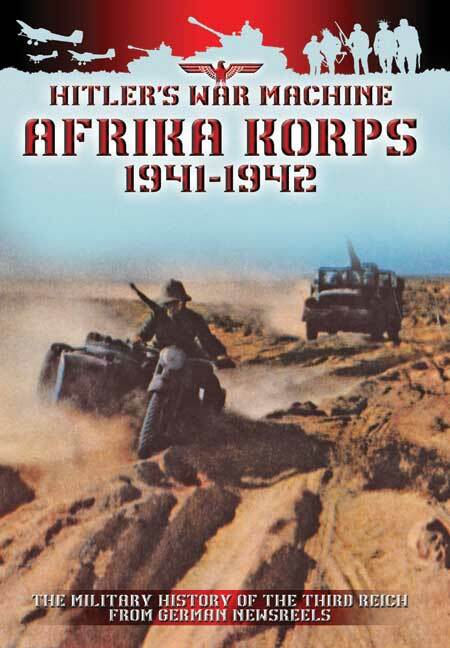 You'll be £9.99 closer to your next £10.00 credit when you purchase Afrika Korps 1941-1942. What's this? This volume features translated Wochenschau newsreels dating from 1941 into early 1942 and records the military events in the western desert from the arrival of the Afrika Korps through to the high water mark, which saw Rommel's forces poised on the brink of victory. A DVD of original German newsreel footage as it would have been broadcast to the public at the time, showing the arrival and parading of the Afrika Korps in Tripoli and their subsequent advance on Tobruk. As one would expect the commentary is very biased and makes for an interesting study in propaganda, particularly in its repeated attempts to portray Britain's colonial troops as sacrificial pawns. The film footage often focuses on artillery exchanges and the advance of motorised columns, but in between are segments which cover a very broad range of aspects of life in the desert, including anti-aircraft and anti-tank guns in action, the work of medical staff, signallers, the typical daily routine of any German soldier, and the unloading and stockpiling of stores in supply dumps. It also follows the arrival of these stores from Europe in the heavily protected convoys which were repeatedly attacked by the Royal Navy, and includes some superb footage of the Luftwaffe engaging the RAF and strafing British tanks.